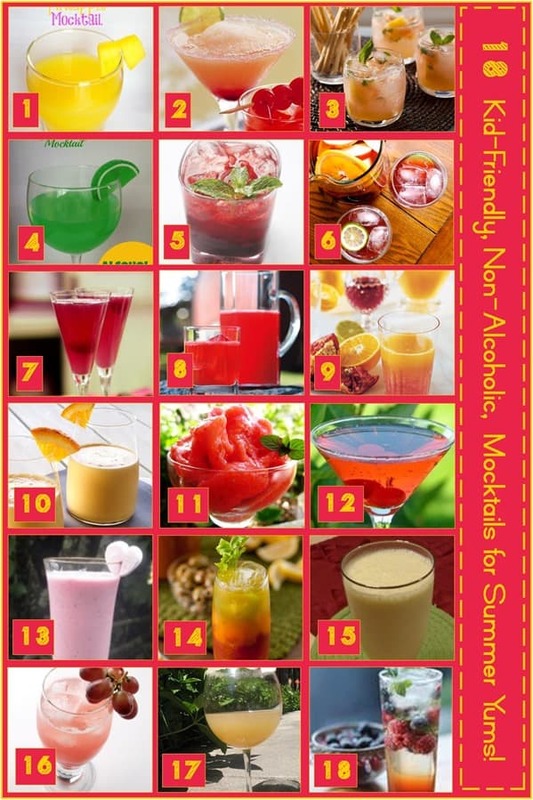 If you are tired of iced tea or just can’t take another soda, try some of these great mocktail recipes for a refreshing beverage on a hot summer day or any day! The entire family can enjoy these fun to make and fun to drink non-alcoholic cocktails. Mocktails are great because they generally have less calories than those that contain alcohol, and every in the family can enjoy them! Many are healthy because they include fruit or fruit juice but no alcohol. Pineapple Mocktail – Perfect for entertaining on Easter or any day of the year. Pink Grapefruit Margaritas – This drink just looks like fun. And would be so refreshing on a hot summer day! Virgin Grapefruit Mojito – A non-alcohol twist on a fun classic drink. Perfect for summer parties or brunch. St Patrick’s Day Mocktail – Perfect for St Patrick’s Day but also a very refreshing drink for a hot summer day! Cherry Smash – Love cherries? You’ll love this cherry flavored beverage! Virgin Sangria – Love a great sangria, but don’t want the calories or effects of alcohol, try this great non-alcoholic drink. Cranberry Kiss Mocktail Recipe – A fun non-alcoholic drink for any occasion. One of the most popular recipes on my site! Raspberry Limeade – So refreshing on a hot day! Great substitute is you usually have lemonade. Pomegranate Citrus Juice – Here is a great one for trying out different juices to make a great mocktail! Tropicana Orange Banana Yogurt Smoothie – Love this smoothie made with Tropicana OJ! Our favorite! Virgin Strawberry Daiquiri – A fun summer day treat for the entire family! Shirley Temple – The classic non-alcoholic drink and a fun mocktail for a little girls party. Creamy Strawberry Smoothie – A fun and easy drink to make on a hot summer day! Virgin Garden Mary – A non-alcohol spin on a early morning favorite drink. If having at a party, you can set out pitchers of carrot juice, tomato "Mary" mix and cucumber water; let guests mix their own drink. Don’t forget the hot sauce and lemon wedges! Banana Coconut Smoothie – Another of our favorite smoothie recipes. Great way to cool down this summer! Grape Sparkler – Fun and yummy drink perfect for entire family to enjoy. Appletini Virgin Cocktail – Love an appletini but the syrup just too sweet? Try this non-alcoholic version. Lemon Berry Mojito – Using Trop50 from Tropicana cuts the calories in half with this yummy faux Mojito! With many of these recipes, you can substitute out various fruits of fruit juices for one that you and your family likes better. And it can be fun just to mix some of the items together and make your own mocktail recipes. Mocktails are the first thing I check on the menu when we dine out. Now I don’t need to spend money on drinks I can make at home.